Our Faith & Hope Tray Milky Way Soap Mold features the words "Faith," "Hope," and "Love" surrounded by intricate borders. This mold is great for gifts or to remind yourself of these simple concepts every day. 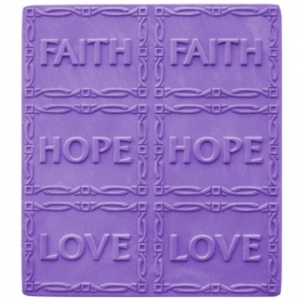 Soap Bar Dimensions: 6" x 6.5" x 1"
Notify me when Faith & Hope Tray Soap Mold is in stock.